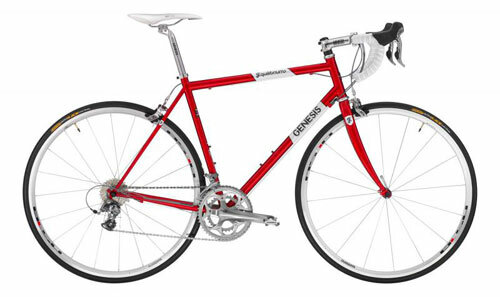 The second distinctive feature of the bike is the steel frame, which these days is a bit of rarity on a road bike. 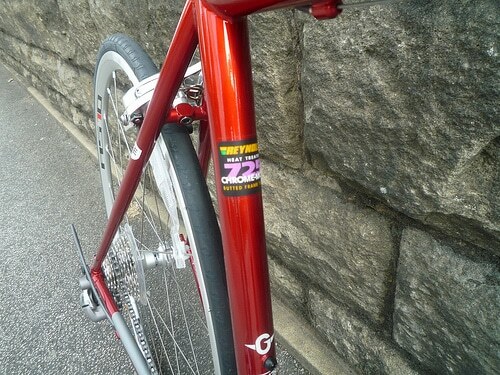 The Genesis 20 bike is based on Reynolds 725 Chromo steel frame. 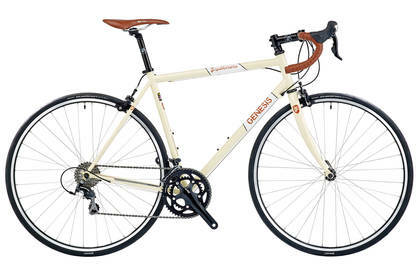 On this model the Genesis Equilibrium 20, the 725 frame is an upgrade from the Reynolds 520 (used in the cheaper Genesis 00). 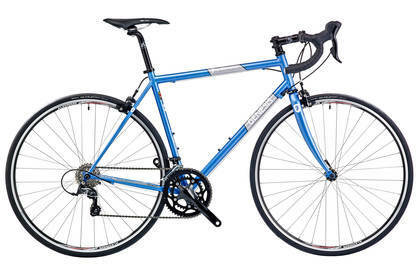 The Reynolds 725 offers more butting and slightly lower weight. To go with the steel frame, is a carbon fork for additional rigidity at the front. With a top of the range steel frame and carbon fork, it unsurprisingly absorbs the roughness of the road pretty well. 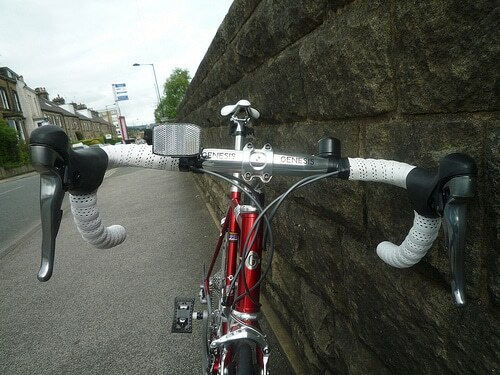 The other components, such as stem and are mainly 6061 aluminium. It makes for a comfortable ride – likely to be popular with commuters and day-tourers. It feels reasonably responsive to ride, though it took a bit of getting used to; it felt quite different to the carbon fibre frames I am used to riding and was just a bit more sluggish out of the starting blocks. But, still overall a good quick ride. A solid performance cycling around a few hills and flats on the test ride. Despite a few touring features, it is also marketed as a road bike, with close to road geometry. (head angle of 72 degrees is slightly less than the usual 73 degrees) But, this low angle gives great performance on descents where it is stable. 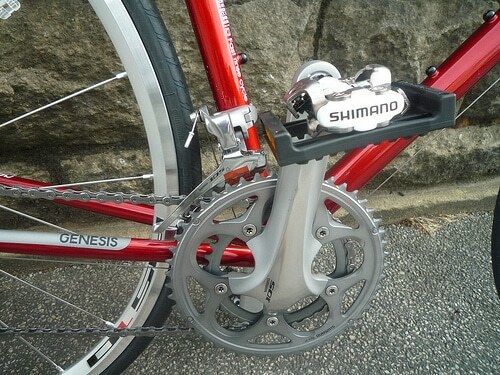 The Shimano 105 groupset is a good addition. It is the kind of groupset that is ideal for a winter training bike / high end commuter. Continental Ultra sport tyres are a fairly good all rounder. Will offer a good combination of grippiness and puncture resistance. Though when they wear out, there are better tyres to get. Tetro Brakes always feel a little bit on the flimsy side. 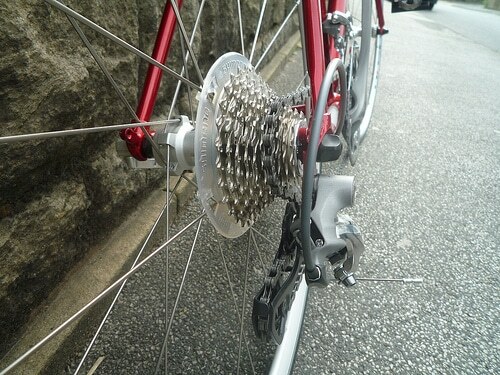 It’s a shame the 105 groupset didn’t extend to these, but it does help to keep the price down. At £1,299 the bike offers good value for money if you are looking for something a little different. If you’re criteria is lowest weight / price – you would be better off looking for a carbon fibre / aluminium bike which will come in at a lower weight. But, weight isn’t everything in the world of cycling. For many cyclists, it is much more important the feel (and the look). We can’t justify buying a bike on its looks (though it may well sway our opinion) but this is is a good choice for a long commuting / training bike. It will not be replacing my racing bike though! Weight: 9.3 kg. A disadvantage of steel with weight higher than some competitors. By comparison the Genesis Volare – used by Madison Genesis racing team is 7.91 kg (link). Not too heavy, but still quite a bit above UCI limit of 6.8 kg. If you want to keep the price under £1,000 you can get the Genesis Equilibrium 10 – which comes with Shimano Tiagra for £999. – No harm in Shimano Tiagra. You get what you pay for. I would be tempted to buy this as a dedicated fast / commuter. At £1,299 it would be a little bit on the extravagant. But, it is a great combination of good looks, style and performance. I would also be reasonably happy to have this as a winter training bike (though with the downside that because it looks so good, you would feel obliged to clean it more often than you actually do) I wouldn’t want to get this for any kind of racing. Despite the emotional attraction of a real steel bike, I need a bit more converting to the merits of steel for race before I swap the greater rigidity of a carbon fibre. But, as long as you don’t have aspirations behind a 4th cat road racing, this shouldn’t be a discouragement. This review initially was published in 2012 on my other cycling blog. I’ve updated on this blog. I’ve included specifications for 2014 models, which are not much different. The 2014 comes in two models. I think the original red, looks better than this white / cream model. You can see the red version on the Madison website. Genesis 20 at Madison Cycles.